Years ago, if you asked Lucas Newkirk about pursuing a graduate-level data science degree, the idea wouldn’t have been on his radar. 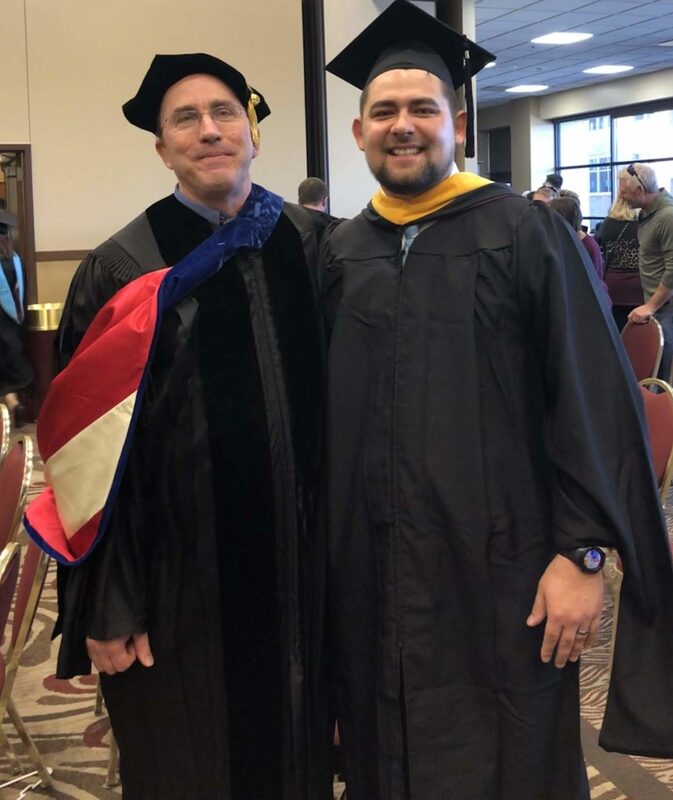 From college athlete to detecting pneumonia in chest radiographs, Lucas’ educational and career journey took a few turns in order to get to where he is today: A December 2018 graduate of the online University of Wisconsin Master of Science in Data Science program. The following is Lucas’ story of finding his way into the data science field. After high school, Lucas’ dream was to play football at UW-Lacrosse. However, after sustaining an injury, he switched gears to focus on his education, transferring to UW-Madison his junior year and changing his major to business management and applied economics. Lucas dove into programming and model building, which led to his first job as a forecasting analyst with Assurant, a small health insurance agency. Seven months into the job, he found himself looking for another, after the company went out of business. Luckily, it wasn’t long before he landed a compliance analyst position at GE Healthcare. One of the biggest barriers in taking the next step in his education was affordability. About a year into his role at GE, Lucas learned that his employer provided tuition reimbursement, and Lucas knew exactly where to enroll. Motivated by his drive to earn a data science degree and to advance in his role at GE, Lucas decided to focus on a healthcare industry need for his capstone project. His final capstone paper was “Classification of Pneumonia X-rays Using Mask R-CNN and Transfer Learning.” In layperson’s terms, Lucas programmed a virtual machine on Google Cloud to increase the efficiency and accuracy of pneumonia detections in chest radiographs. The Kaggle challenge further states that the current approach to detecting pneumonia relies on highly trained specialists who are faced with reading large volumes of images, which often complicates efficiency and diagnostic accuracy. Internationally, pneumonia is among the top five leading causes of death for children under the age of 5 years old. The obvious need in the healthcare community, paired with the challenge of flexing his data science skills, inspired Lucas to use the Kaggle competition as the basis for his capstone. Lucas knew he didn’t have much of a chance to compete as an one-man team against big companies in the Kaggle competition. Realistically, his main goal was to figure out how to program the virtual machine with a working algorithm that led to positive pneumonia detection results. The biggest success for Lucas was getting his virtual computer model to train to his algorithm. Figuring out the coding and using a variety of installation packages pushed his problem-solving skills to new heights. Relying on a paper published by Facebook AI titled “Mask R-CNN”, Lucas learned how to segment images, teaching his virtual machine to identify objects in chest radiographs through focused outlining. This outlining method steered away from the traditional use of bounding boxes that simply draw a square around an area of interest. The outlining algorithm provided a more vivid and accurate detection of hazy sections that could be diagnosed as pneumonia. Lucas with Dr. Jeffrey Baggett at graduation in December 2018. Using the data science skills that he learned in the UW Master of Science in Data Science curriculum helped Lucas navigate through the roadblocks and challenges of his capstone. Lucas credits the DS 700: Foundations of Data Science course for teaching him how to investigate, analyze, and complete complex data science class projects. DS 710: Programming for Data Science gave him the coding skills to get started and inspired him to continue learning Python, which turned out to be the language he used for his capstone. DS 745: Visualization and Unstructured Data Analysis helped Lucas learn critical presentation skills to display data in a graphical way, which he applied to the charts and data featured in his capstone. Flexibility in class schedule and assignments was a must for Lucas. He couldn’t travel outside of Milwaukee because of his work commitments, and he didn’t want his contribution at GE to suffer from being spread too thin. The UW Master of Science in Data Science online program afforded Lucas to work at his own pace and provided access to professors and faculty members outside of typical 9-to-5 work hours. Lucas admits he worried that online class sizes would be infinite, since anyone could log onto a computer at anytime. However, his classes were not too large to manage, because UW Extended Campus tracks average enrollments per course section and caps enrollments for any course at 30 students. When needed, additional sections are available for courses that exceed the 30 student maximum, ensuring access to all students while maintaining an optimal learning outcome. Students participate in projects and discussions in smaller groups within each course section. Online student resource lounges also help students stay engaged through peer interaction. With the capstone project and an UW Master of Science in Data Science degree added to his résumé, Lucas is excited to dive into another Kaggle competition, continue to collaborate with colleagues and other data science peers, and to focus on using his experience in the degree program to hone his skills. For individuals considering how a data science degree can help them with their career aspirations, Lucas is quick to encourage them that now is a great time to dive in. If he had known the experiences he’d gain and skills he’d acquire in the UW Master of Science in Data Science online degree program, he would have enrolled sooner. Start exploring how the UW Master of Science in Data Science online degree program can push you to new career heights. Have questions about the courses, tuition, or how to apply? Talk with an enrollment adviser by emailing learn@uwex.edu or calling 1-877-895-3276. UW Master of Science in Data Science is a collaboration of UW System campuses. Lucas earned his degree from UW-La Crosse.